Forgive the dramatic post title, but isn't it true that the littlest things can sometimes make the biggest difference? Our house has been in a constant state of flux and construction this year, so some intentional touches (like window treatments) have gone a long way for my sanity. When Barn & Willow reached out offering a few pieces for our new home, I couldn't resist. Barn & Willow offers gorgeous, custom drapes at one-third of the price you see at other retailers. Their linen is world class, with just the right amount of texture and weight. 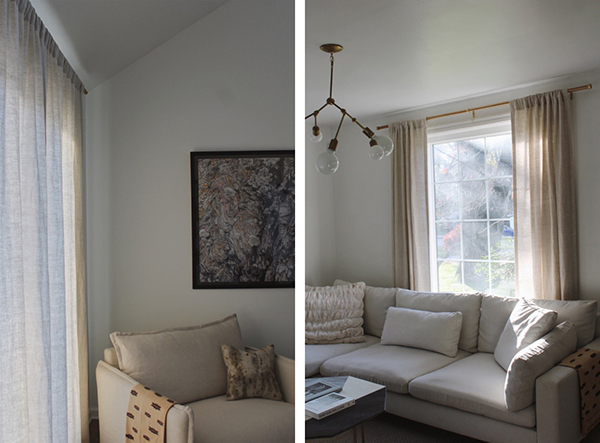 For our living areas, we went with the soft top style curtain in Natural Belgian flax linen. In our bathroom, I opted for the sleek and sophisticated flat roman shade in Off White. I will eventually add these to our bedrooms as well—they feel so simple yet glamorous.